Well, tea, cake and vintage clothes to be precise. 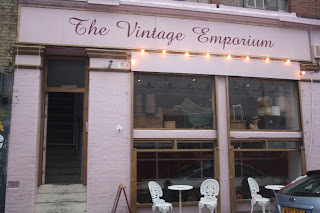 Two recent finds from the blogging world of Tea Shop/Vintage Emporiums are not helping my long held desire to own such a shop (though mine would also sell Penguin books and vintage homewares). 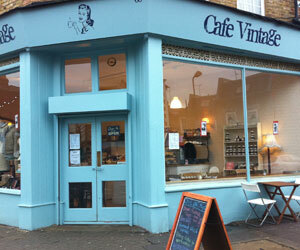 A friend of mine introduced Cafe Vintage to me last week as we were driving past but I have not gone back yet, is it said to be reallllly nice? It's a little shop too right? The road that it is on is not where you would expect something so lovely looking to be, it's round the back of Arsenal/Fins Park St & on a tiny strip of small shops and takeaways! I need to go, you have inspired me to go sooner than I would have done. Let me know when you are down and we'll meet up and go to the Vintage Emporium together. I'll resist the temptation till then. Make a fun blog tea meet out of it! But I'm hoping to do a weekend in London over the summer. I like your use of blogging as an excuse for tea, cake and vintage clothes shopping. I was having a think. I have been in the VEmporium, but only downstairs where I think they have things to buy that are not drinkable. Blogging is always a great excuse for fun things!